Health and wellness goes well beyond getting plenty of sleep, drinking water, and eating a healthy diet. There are many additional, holistic therapies which can work to help the body function in a more effective way, whilst also making you feel better as a result. Massage is one of those therapies, and it is one which has been around for centuries. A massage is a relaxing experience, a time to totally chill out and allow the practitioner to work out all the knots and tension in your body, and leave you feel liking you’re floating on a fluffy, weightless cloud. Relaxation aside, massage actually has a whole host of other health benefits too. So, if you’re on the fence about whether massage can help you, let’s get a little more in-depth and learn more about this ancient therapy. 2.1 What Is An Electronic Massager? Massage encompasses a range of techniques and pressures which are applied to the body by a qualified practitioner. When done correctly, massage works to eradicate tension, iron out knots and ‘bunched’ muscles, and also relax the mind. The manipulation of the body encompasses the connective tissues, muscles, ligaments, joints, and tendons, and can be particularly useful in anyone who suffers from aches and pains, or those who have physically demanding jobs. Now we know what massage is, we need to explore what you can gain by having regular sessions. Massages are becoming more common as a regular treatment option for certain medical conditions, as well as for those who regularly experience chronic pain, such as arthritis or fibromyalgia. Of course, there is the luxury side of it, but there is a very real case for massage being a medical treatment too. Helps improve skin elasticity, which can reduce the appearance of cellulite and help prevent stretch marks. Of course, there are some warnings and contraindications that we need to mention in relation to massage. If you have any aches and pains that are persistent, then you should obviously get this checked out with your doctor, before deciding that a massage is all you need. There are many different types of massage within the spectrum, and with each type there are subcategories of pressure, e.g. some may like deep pressure during a massage, whilst others may prefer a lighter touch, for a relaxing feel. A Swedish massage is one of the most famous, and is quite suitable for most people. This is a gentle type of massage, and is firstly used for relaxation, and secondly to energise and bring about a sense of wellbeing. During a Swedish massage, long strokes are used, as well as circular motions, and kneading movements. Tapping and vibrations are also used to stimulate the blood flow and energise once the massage is over. A deep massage is a more vigorous type of massage, and one which uses more pressure and firmer strokes to get to the root of any muscle pain or discomfort. The strokes in a deep massage are slower and pressure is much harder. This is to ensure that the deeper layers of the muscle are stimulated and manipulated, as well as the deep connective tissues. These types of massage are commonly used for those who have experienced an injury to a muscle. A sports massage is really what it says on the tin, and it is aimed towards those who regularly play a particular type of sports. This can be to aid healing of an injury, but regular sports massages have been shown to increase mobility and strengthen the muscles, to prevent injury from occurring in the first place. The process is very much like a Swedish massage, but focuses mainly on the part of the body that is used the most in that particular sport. A trigger point massage is very similar to a sports massage, because it works to release and relax the tight fibres of the muscles which can become injured or strained from regular use or after an injury. Again, deep pressure and long strokes are used to focus on that particular area. Finally, we have an Indian head massage. Many people consider this to be a truly holistic type of therapy because it uses the chakras in the body, in conjunction with massage movements that are mainly focused on the face, head, neck, and shoulder area. And there you have it, your ultimate guide to massage. There are many benefits on offer to those who have regular massage therapy, and it may just be the difference between pain and relaxation for you. What Is An Electronic Massager? The term electronic massager covers a broad spectrum of products, across a wide range of prices, each designed with a specific massage goal or massage goals in mind. Be it therapeutic massage, a massage to promote injury recovery, performance enhancement, or simple relaxation and stress reduction massage, there is a personal electronic massager for you. By definition, an electronic massager is a device which is operated by a power source such as replaceable batteries, rechargeable batteries, an electrical cord, or a combination of all three. The electric massager does most of the work as opposed to a manual personal massager where the amount of pressure is applied by the person using the massage device. The purpose of an electronic massager is to simulate the function of a massage therapist by re-creating a deep kneading Shiatsu-type massage, or Swedish-type massage which is most often associated with relaxation by using long surface strokes. Some professional massage therapists do not believe in the use of these devices to replace the human touch, however, many now incorporate personal electronic massage devices into their practices, to enhance the massage experience for their patients. Further, many individuals who have become accustomed to using electronic massagers, prefer them over conventional massage, and use their personal massager as their primary means of massage. Although some electronic massagers are designed for specific parts of the body, many can accommodate numerous areas, and others are marketed to deliver a full body massage. In addition, electronic massagers use a variety of different massage techniques, each providing unique massage experiences, depending on the area of the body, and specific massage goal. Again, some devices deliver only one technique, while others incorporate all. Shiatsu massage as discussed above originated centuries ago in Japan, and when performed by a massage therapist, uses fingers, thumbs, palms, forearms, elbows, knees, and feet to release energy in pressure points which affect various parts of the body. Modern day Shiatsu massage is commonly associated with release of tension, dissolving of knots and crystallization in the muscles, and overall relaxation. 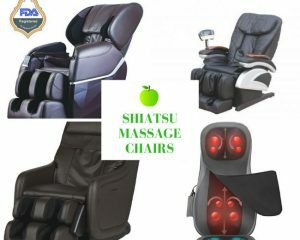 Shiatsu based electronic massagers, use hard balls, referred to as rollers or nodes, which rotate clockwise, counter clockwise, or in both directions to simulate the action of a Shiatsu massage therapist. Shiatsu is great for the back, neck, shoulders, legs, and feet, but is not recommended for the head and face area. After a long stressful day at work, or after strenuous physical activity, an electronic Shiatsu massager is the perfect fix to alleviate pain, soreness, or simply relax. Swedish massage is meant to promote relaxation and is based on physiology and anatomy as opposed to energy, in the case of the Shiatsu massage. The primary technique used in Swedish massage are long smooth strokes which can be soft and gentle, or more vigorous, depending on the goal of the massage. The Swedish massage function used in electronic massagers, are generally not referred to as Swedish massagers, however, they do a very good job of simulating a Swedish massage and have the same calming effect on the central nervous system and provide a tremendous sense of relaxation. Typically, they are found in back and leg massagers, and consist of soft or medium rollers which move up and down the full length of the back or leg. Percussion massage, as the name suggests, is a tapping, beating, or hammering action to penetrate deep into the muscles to relieve tension, stress, and knots. When performed by a massage therapist, the hands are made into a fist, and a pounding motion is used. Electronic massagers mimic the same action using hard nodes covered by a rubberized material to soften the blow, so to speak. The intensity level and speed in most devices are adjustable allowing for a lighter, softer massage or a vigorous, aggressive massage. Percussion electronic massagers are effective anywhere on the body excluding the head and scalp area. Vibration massage when performed by a professional massage therapist, uses a shaking like action in the fingers, palms, and thumbs. It is generally done in short bursts, with intermittent pauses. The vibration massage function on most electronic massagers are nodes which deliver a trembling type action, measured by pulses per minute. Some devices are adjustable while others are not, however, the pulse rates typically range from 1,500 pulses per minute to 5,000 pulses per minute. Vibration can be used anywhere on the body, however, the intensity level should be scaled down on sensitive regions. Some of the positive effects of using a vibration massager include soothing nerve damage, breaking down scar tissue, increasing blood flow and circulation, overall relaxation. The primary purpose of compression massage therapy is for the treatment of ischemia, which in layman terms means a lack of blood supply. In fact, this type of massage therapy is often referred to as ‘ischemic compression massage‘. When performed by a massage therapist, it can be very painful, as the therapist stimulates blood flow by stretching a relaxed muscle until it reaches an 8 or 9 out of 10 pain level. This is necessary to remove blockages and get the blood flowing to the affected areas. The compression massage technique is primarily used in electronic foot massagers, and electronic leg massagers. These devices use adjustable air compression to achieve the same effects with much less pain and discomfort. Although it is not considered a specific massage technique, a heating option is really a must, to fully heighten the massage experience. Not only does heat feel good, but it also prepares the muscle tissues, joints, and tendons for the electronic massage procedure by softening, soothing, and relaxing. Some devices include one heat setting, while most include an adjustable variable setting. For safety purposes, it is also important to ensure that the electronic massager has an automatic shut off in the event of falling asleep or forgetting to turn off the unit. Aside from the massage technique, electronic massagers come in a variety of different designs and styles based on the type of massage they are performing. If you are sitting on the fence as to whether you should invest in a personal electronic massager, the following information should help you make that decision. Here, we outline some of the general benefits of ownership, as well as the major health benefits. Today, the average massage price in the USA is approximately $60 – $100 per hour, and at higher end massage clinics or wellness spas, it is not uncommon to see that price reach $200 – $300 per hour. Depending on the type of electronic massager you purchase, the unit can pay for itself in as few as 2-3 sessions. In addition, a personal electronic massager will reduce the number of times you visit a professional massage therapist, and even eliminate the need to go. Some ailments and injuries require very frequent massage therapy treatments. In some cases, every day. Aside from the cost, it can be extremely time consuming. A personal electronic massager gives you access 24/7, in the comfort of your own home. No more booking appointments, driving, and rearranging your schedule to make an appointment. We know our bodies better than anyone else, and when we have soreness, chronic pain, or any other ailment, we know exactly where it is and what it requires. Administering a self massage can often be more effective than having a professional perform it. Owning a personal electric massager allows this. Massage therapy has become accepted by the medical profession as a viable treatment for many medical conditions. Research has proven positive effects from massage, and most insurance plans will over a portion of massage therapy treatments, and some will cover the cost of personal massage devices. Massage therapy has numerous health benefits, most of which can be realized by using a personal electronic massager. At A-Z Health Families, we pride ourselves on researching various health related products and developing “7 Best Lists” based on our research. Following is a brief description of the best electronic massager in each category, and a link to the full list and reviews. The Naipo Shiatsu Back Massager is a cushion style electronic massager, which is ideal for the neck, shoulders, waist, and legs. It includes 4 rolling Shiatsu nodes which change direction every minute and can deliver a surface massage or a deeper tissue massage. The device has an excellent heat option, is light weight, portable, and can be used any where there is a n electrical outlet. The see a full review of the Naipo Shiatsu Back Massage Pillow Massage Cushion, and the entire list of the best back massagers, click here. The TheraSqueeze, manufactured by Brookstone, was our #1 pick in the leg massager category as it not only delivers to the feet and lower legs, but also the thighs. Very few competitive products have this ability. 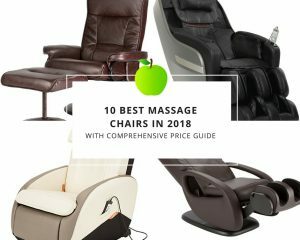 In addition, it includes three massage techniques, air compression, Shiatsu kneading, and vibration, all at a tremendous price point. Further, it has 3 intensity settings allowing a tailored and customized massage. 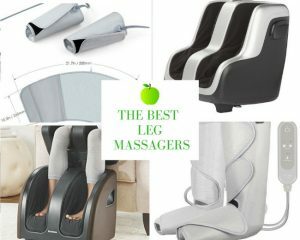 The see a full review of the TheraSqueeze Pro Foot Calf and Thigh Massager, and the entire list of the best leg massagers, click here. The PureWave CM7 is a handheld electronic massager, and is manufactured by PADO Products, a world leader in personal massage products. The CM7 is the top of the line massager at PADO and has received a 4.5-star rating based on 1,500 reviews. The PureWave CM7 uses percussion massage which is the most effective for cellulite reduction, has 6 different attachments each providing a unique massage experience. In addition, the device has a special facial massage feature which uses microvibration and runs at 11,000 RPM’s. The unit is light weight, cordless, and is easily transported. To see a full review of the PureWave CM7 Massager, and the entire list of the best cellulite massagers, click here. The Marnur Foot Massager uses a combination of Shiatsu rollers and air compression to work wonders on foot pain relief including aches, knots and muscle tension. It includes 3 adjustable intensity settings and allows the heat function to be activated to enhance the foot massage experience. The Marnur is light weight, and compact enough to store under a bed or in a closet. It has a 4.5 star rating and is ranked #1 on our list. The see a full review of the Marnur Shiatsu Massager, and the entire list of the best foot massagers, click here. The Breo organization, has developed a tremendous reputation in the personal massager marketplace, and their company moto is “Health starts from the head”. What better company to purchase a head massager from. This cordless electronic massager delivers a second to none massage to the head and eye region by using a combination of air pressure, vibration, and heat. It includes 5 separate air pressure settings, 5 vibration settings, and 2 heat setting to provide the most customizable head massage available. It is cordless, includes a rechargeable lithium ion battery, and an MP3 player to enhance the experience. The see a full review of the Breo iDream 3 Eye and Head Massager, and the entire list of the best head massagers, click here. Keeping inline with the quality, reliability, and functionality of the Brookstone name, this cordless neck and back massager is #1 on our list. It has 8 Shiatsu nodes and handheld shoulders straps to accurately pinpoint the device on knots and aching muscles. Its heating function is excellent, to further penetrate those tire aching areas. It has received a 4.5 star rating on Amazon based on 167 reviews. The see a full review of the Brookstone Cordless Neck and Back Massager, and the entire list of Best Neck Massagers, click here.